The mother of a 19-month-old boy says she and her son were kicked off a plane after she refused a stewardess' request to medicate her son to keep him from talking. Kate Penland, who lives in Gwinnett County in suburban Atlanta, said she and her son, Garren, had boarded the Continental Express plane last month after an 11-hour delay in Houston on a flight from Atlanta to Oklahoma City. Garren kept saying, "Bye bye, plane," Penland recalled. And she said the stewardess objected. "At the end of her speech, she leaned over the gentleman beside me and said, 'It's not funny anymore. You need to shut your baby up,"' Penland told WSB-TV in Atlanta. When Penland asked the woman if she was kidding, she said the stewardess replied, "You know, it's called baby Benadryl." "And I said, 'Well, I'm not going to drug my child so you have a pleasant flight,"' Penland told the TV station. "I was crying, I was upset and I was thinking, 'What am I going to do? I don't have anything with me, I don't have any more diapers for the baby, no juice, no milk," Penland said. The young mother said she later learned the flight attendant told the pilot that she had threatened her. Penland said that never happened. Express Jet Airlines released a statement saying, "We received Ms. Penland's letter expressing her concerns and intend to investigate its contents." 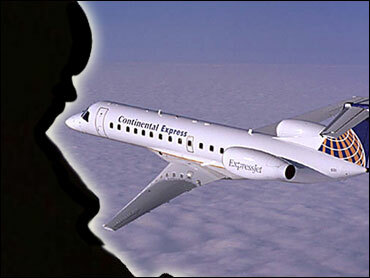 Express Jet did not immediately return a call Thursday from The Associated Press.